End of August I went on a fishing trip to a place called Espevær. 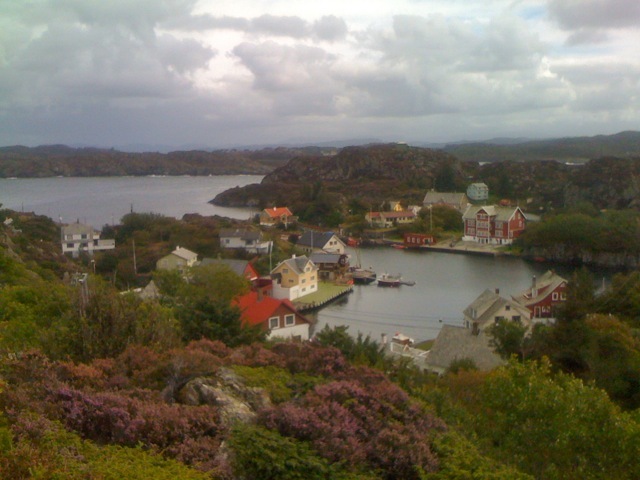 It’s about 1 1/2 hrs south of Bergen, right out in the North Sea and consists of a larger island with many small islands surrounding it. The open sea is rarely tranquil and storms are frequent. 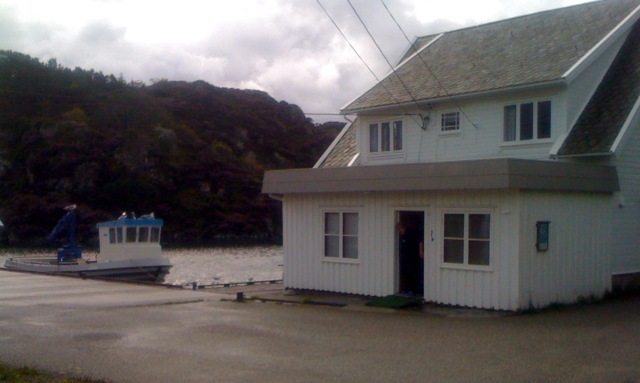 But thanks to a sheltered harbor its been home to fishermen for many years and about 150 people still live there. The main island has a relatively lush interior, but you are never far from the sea. Taking a stroll around the village only takes a few minutes and another 20 minutes takes you around the main island. 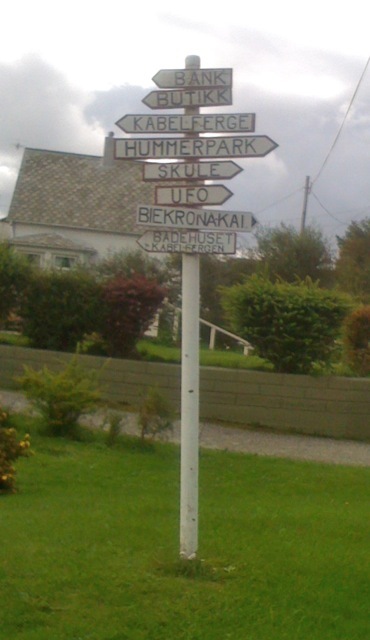 The village signpost conveniently points to all the main attractions: the store, the cableferry that crosses the harbor, the old lobsterfarm (a big hangar where they raised lobsters), and the famous UFO ring. This mysterious print in the ground appeared one stormy night in the 70’s and is still visible on the field where a UFO may have landed, no other explanation has been found (yet). This was not my first visit here, I had also been in here some 20 years ago with my family on a boat trip, but this time I went with a group from my neigborhood association. We stayed in an old cafe, recently converted to a large apartment. A boat was also provided and it was a real no-frills workhorse. So off we went to catch some fish. The catch was mostly lyr (pollock), but also a few makrell and a weird thin fish. The weather was not the best and it alternated rapidly between rain and sun all weekend, thanks to strong winds. 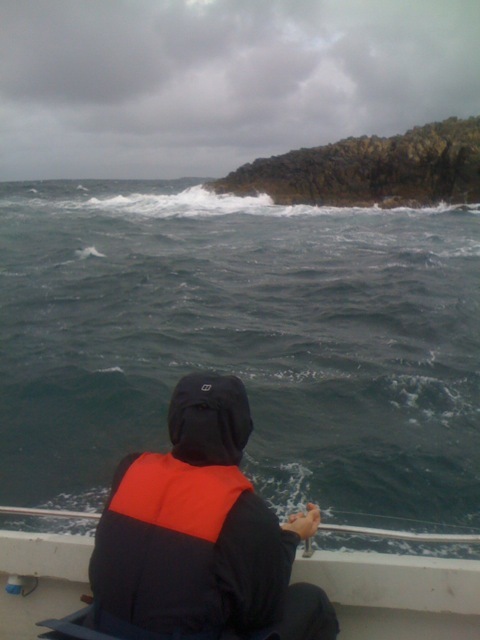 Same winds contributed to rough seas and we were limited to fish in the shelter of the smaller islands. We had a local in the group so navigating the treacherous waters was not a problem. But I have never fished under such conditions before and got a taste of the real risk and hardship fishermen face in the North Sea. I am not sure the picture really conveys how rough the sea was, unfortunately I was using the iPhone and it doesn’t do movies. But I had to keep my arm around a pole to avoid falling over while taking this shot! All in all an exciting trip.